42. Wissenschaftlicher Kongress Deutsche Hochdruckliga e.V. 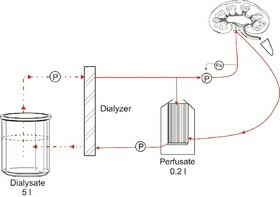 A relatively small volume of perfusion medium (200 ml) contains albumin as colloid and recirculates continuously through the kidney from the mouse or rat. It is dialyzed against the 25fold volume of a protein- and cell-free solution. Consumed metabolic substrates and loss of volume are replaced by the dialysate. A great distribution volume (perfusate plus dialysate) is at the disposal of the uremic toxins produced by the kidney. 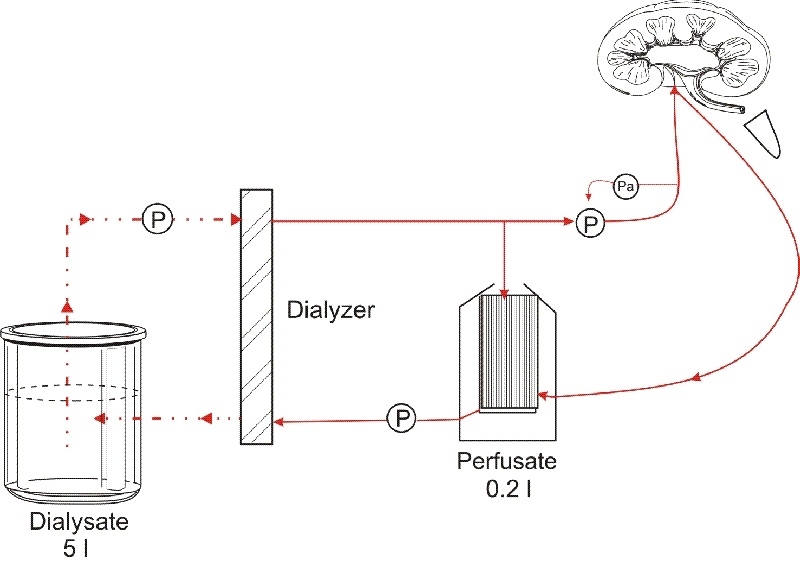 The oxygenation of the perfusion medium via the dialyzer („dialung“) is simple by bubbling the dialysate with the respiratory gases using sintered glass. With this experimental set-up the function of the isolated kidney is stable for at least 3 hrs. The glomerular filtration rate is almost identical with the corresponding in vivo value (0.8 to 1.1 ml/min). The fractional sodium reabsorption, which is a very sensitive marker for a well preserved renal metabolism, averages 97 to 98% under standard perfusion conditions; glucose reabsorption is about 100% of the filtered load at normal perfusate concentrations, indicating the usefulness of the preparation in studying the reabsorption and uptake of organic solutes. The isolated kidney is responsive to proximal, loop, and distal diuretics, as well as to hormones and growth factors like urodilatin, insulin-like growth factor-I, vascular endothelial growth factor, or leptin. Hence, the isolated perfused rat kidney has become recognized as a suitable preparation for the study of many physiological, pharmacological, and biochemical aspects of renal function, and represents the connecting link between other in vitro systems (such as, cell cultures, tissue slices, or vascular strips) and models with experimental animals.